Thailand and Hong Kong unite to bring you all one EPIC release! J.P. TOYS x Kaiju One present to you “The Trinity Thai” painted by SkullPuppet, this new edition KAIJU ONE’s “TRINITY” stands at around 13.5 inches worth of soft vinyl. A multi-faced figure for all the looks you need. SkullPuppet has done an impressive job on the paint application especially around the armour! 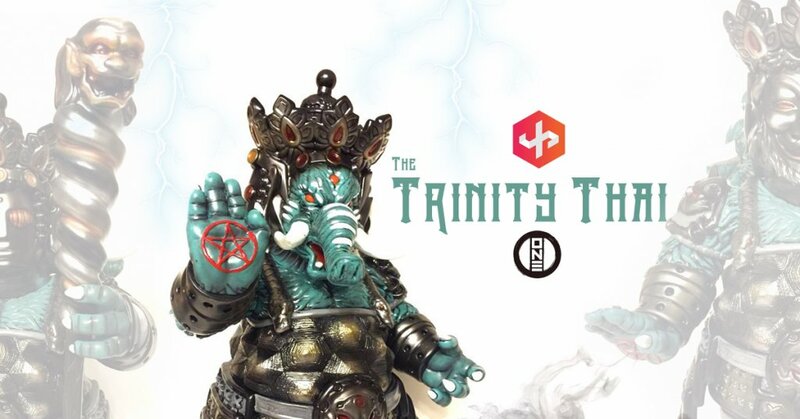 So here comes the good news, J.P. TOYS x Kaiju One is offering you the chance to own The Trinity Thai. With only 25 this ain’t going to end pretty (unless you win one). Details on how to enter for a chance to own one below. Good luck. Limit 1 pc per customers. Location: JP TOYS Facebook HERE. During the selling date, we will post the form for customers to fill in at JP TOYS Facebook. The form will close immediately once it reaches quota. You can find Kaiju One on Instagram and new Facebook page HERE.